Size exclusion chromatography system Waters, including a Waters 1515 isocratic pump, Waters 2414 refractive index detector, styragel columns and controlled by the Breeze software. Wide-angle static and dynamic Light scattering photometer ALV GmbH CGS-3 Compact Goniometer System with an Avalanche photodiode detector, interfaced with an ALV/LSE-5003 electronics unit and an ALV-5000/EPP multi-tau digital correlator. The system is equipped with a Polyscience model 9102 bath for temperature control, Glan-Thompson polarization prism and various types of cells. 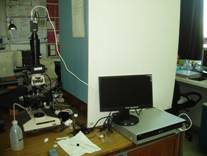 Microrheology set-up, including an Olympus BH2 optical microscope, high definition and capture velocity CCD camera and image analysis software especially developed for this purpose. The setup performs microscale rheological characterization of macromolecule and colloid solutions, by use of suitably selected colloid tracers ιχνηθετών .. through which conclusions can be drawn related to the structure, dynamics, interparticle/intermolecular interactions, as well as phase transitions in such systems.